Aside from fashion, I LOVE food and enjoy cooking and trying out new recipes whenever I have time. I want to be able to share my latest creations with everyone, so I’ll be doing some food posts every now and then. Sometimes they’ll be my own recipes and other times, I’ll take them from somewhere/someone else. I hope you enjoy them! Mix the ground turkey meat (I used half regular and half all-white meat so it was a bit leaner) with a bit of garlic powder, salt and pepper to taste, and 5-7 drops of hot sauce. Divide into two equal patties. Heat grill pan to medium-high heat and cook both sides for about 5 minutes each. Add American cheese (as many slices as you’d like) for the last 2 minutes. 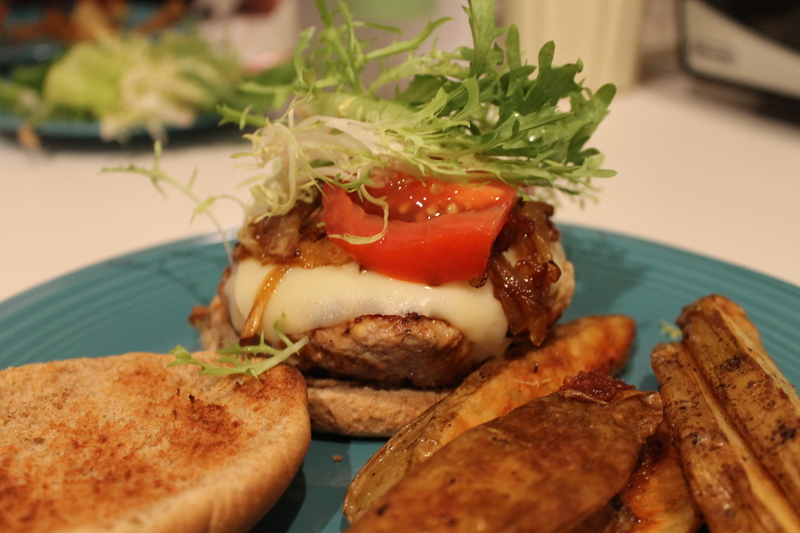 Serve on toasted bun with frisee lettuce, sliced tomato, and caramelized onions. Chop half an onion. Heat olive oil (enough to cover the bottom of the pan) to medium heat (you don’t want to burn the onions). Add onions. Cook for about 10 minutes. Add salt and a pinch of sugar. Let it cook for another 20 minutes. Heat oven to 450 degrees. Cut 2 clean, scrubbed, Yukon Gold potatoes in long slices to form wedge-shaped potatoes. Mix wedges in a little bit of olive oil, Kosher sea salt, and pepper. Place on baking sheet and bake in the oven for about 20 minutes. Previous Wedding Inspiration: The Dress! I’m going to try this recipe real soon and test it out. Good job! The photo is mouthwatering.